People often say, you can’t improve on a good thing. At Riverbed, we don’t believe that. Take WAN optimization. Yes, we’ve led the market for eight years—a leader in Gartner’s Magic Quadrant for WAN Optimization. But we have never stood still. We added integrated visibility so you see into the modern encrypted app to identify, classify, prioritize and steer that app down the best path—MPLS or public Internet—to any user. And controlling that app is now automated with the ability to use application groups, business-driven global policies and secure transport for greater business agility and cost savings. Why do customers invest in SteelHead? Customers use SteelHead to accelerate application performance and to scale so they can accelerate more traffic with less resource consumption. 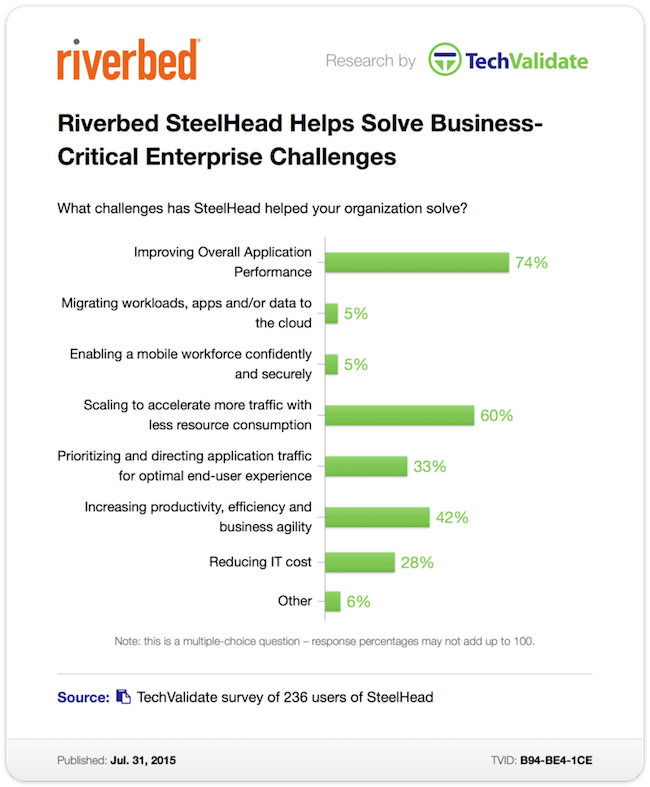 But, as we expected, SteelHead is key to new global trends such as enabling a mobile workforce and branches and delivering workloads, apps, and data faster from the cloud. Increasing user productivity, IT efficiency, and business agility while reducing costs is Riverbed’s business bread and butter. Many organizations run hundreds—or even thousands—of applications on their networks. Yet only Riverbed can claim the ability to identify and classify over 1,300 apps. And the list of apps that SteelHead identifies and accelerates reads like a veritable who’s who of enterprise and cloud applications. 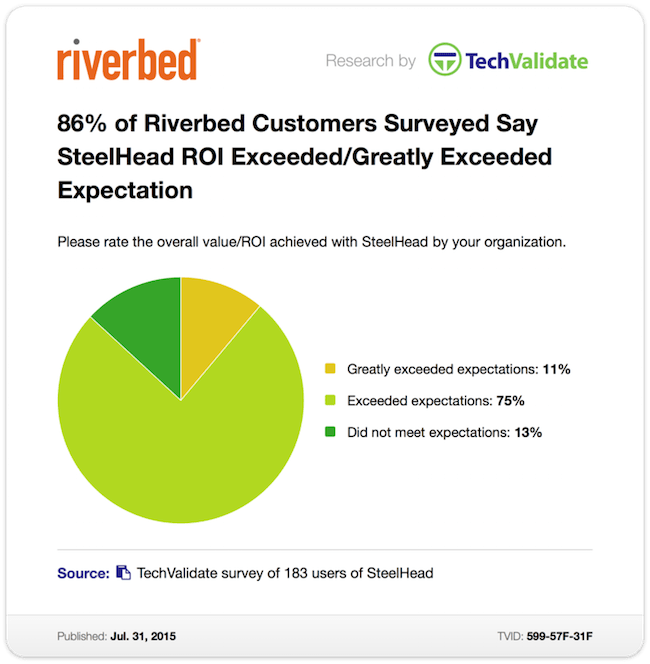 Riverbed customers also are using the full breadth of the Riverbed offering to improve visibility into applications by combining the visibility and reporting of SteelCentral™ NetProfiler and the application acceleration of SteelHead solutions. 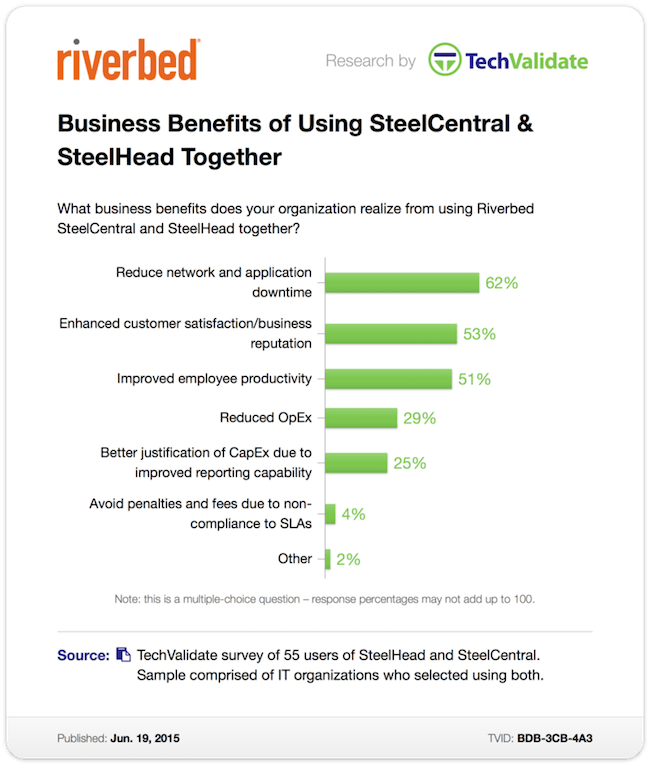 Join those satisfied customers, and learn what SteelHead can do for your enterprise. For more information on SteelHead, check out the SteelHead product page.